Carrying on with our new Top 5 category of posts, we’re going to go into industries and pull out our top 5 brands in those industries who are performing best on Facebook, Twitter, and if possible, Instagram. We’re beginning with one of the most popular industries to follow on the most popular social network: sports brands on Facebook. One thing that’s been noticed throughout the research for this post is that sporting goods brands tend to serve different markets; geographically, and product-wise. This leads to different pages for, for example, football, basketball, lifestyle etc. We’re looking mostly at the UK pages, as Facebook now automatically redirects UK traffic to UK pages for big brands. For example, type in facebook.com/adidas and then once the page loads, you’ll see facebook.com/adidasuk. Sneaky redirects. As you can see, Social Bakers have handily listed their top 5 sports brands on Facebook, and there are no great surprises. Here are our Top 5. Their content is sharp, always immensely on-brand. It’s intense, it’s elite, it’s captivating. Easily the number one sporting goods brand on Facebook. Nike and Adidas rarely are apart in these kinds of lists when it comes to sporting goods, but I think Nike are far and away the leader of the pack when it comes to social. Adidas are at the head of the chasing pack. Always Adidas’ little brother, even if Rudi was the older one (Don’t get this? Read more here). 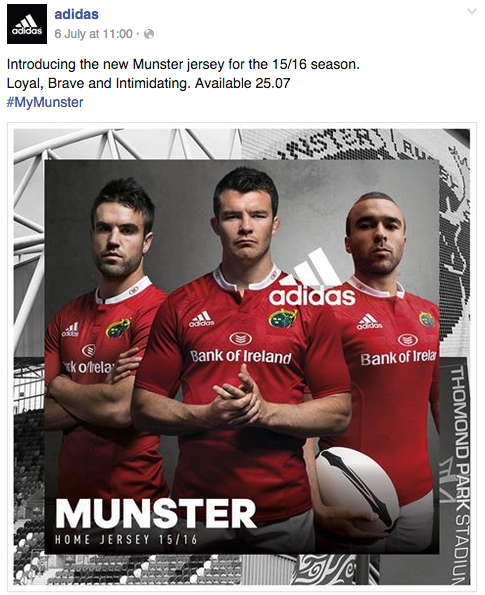 Except PUMA are showing their younger brother how to do it on Facebook. 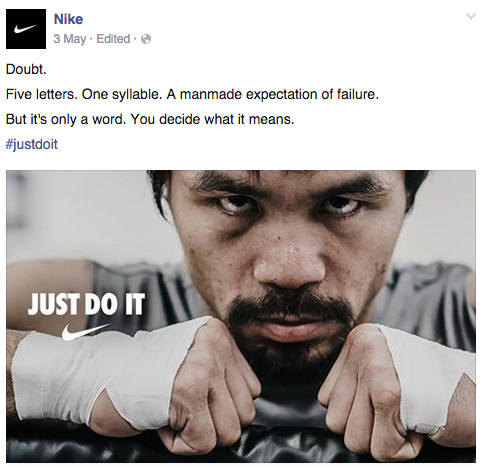 They may have 7m fewer Facebook likes than the Three Stripes but their content puts them way ahead. And that, Adidas, is how you place a logo. 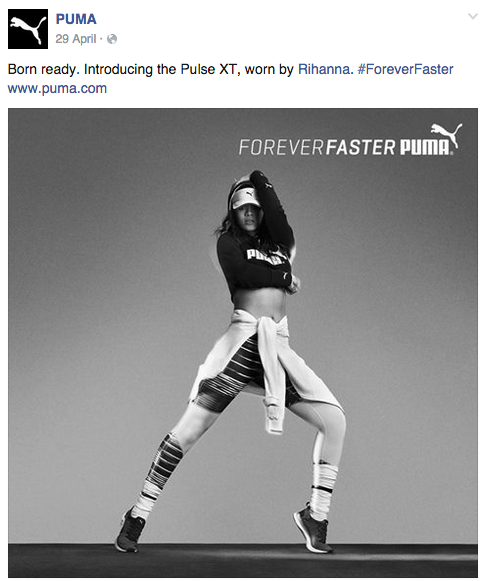 One negative about PUMA is that they clearly don’t police or monitor their comments. All sorts of ‘where’s my delivery? !’ comments nestled alongside people linking to eBay auctions for PUMA shoes. This could be done a lot better. 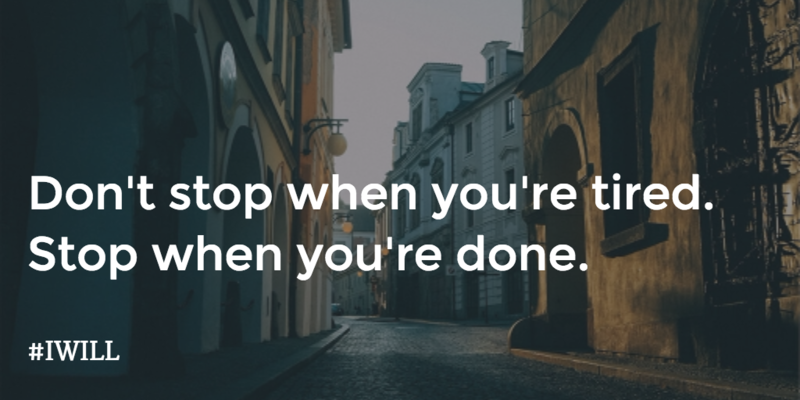 That took me all of 1 minute to do, using Buffer’s Pablo tool. Still not perfect, but I’d hedge my bets it’d get a lot more engagement than a plain text update.I promised myself I wouldn’t put brands on blast in these Top 5 things for underperforming, but c’mon, Under Armour UK have 3.5m fans on Facebook. The post I picked out isn’t even an anomaly, go see for yourself. Must do better, UA. 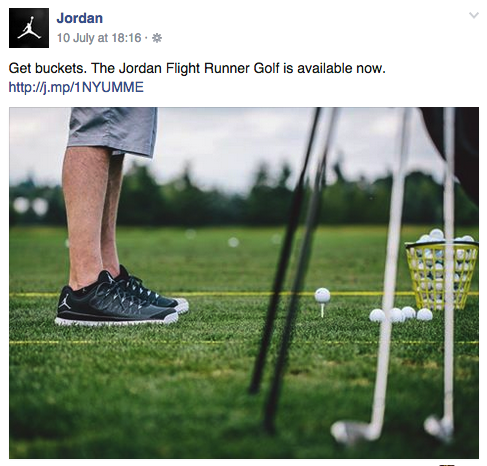 “Get buckets” is a basketball term, and they play on it nicely whilst promoting their golf shoe. It’s sort of funny, keeps the basketball fans engaged, and opens them up to another sport where they can lace up in Jordans. 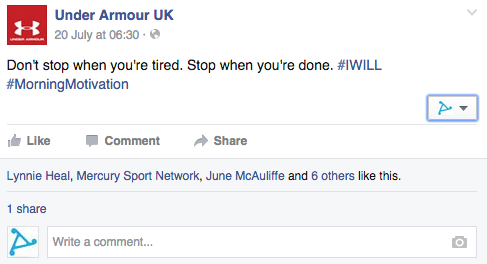 So that’s our top 5 sporting goods brands on Facebook! We tried to mix them up a little as you’ll see that Nike truly dominates the social space, if you checked out the Social Bakers link at the top of the page. Have we missed any brands that you think deserve a mention? Let us know in the comments below!